To set your preferences for email notifications, click on Preferences at the top right corner of Etudes. Click on the Edit icon to the right of Notifications. This allows you to select whether or not you want to receive email notifications from your classes, in select areas, and how often. If you select to receive email notifications, they will be sent to the email address that is associated with your Etudes account. 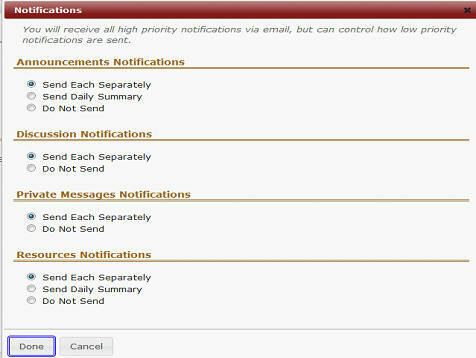 Please note that instructors have the ability to send high-priority notifications and override these settings.